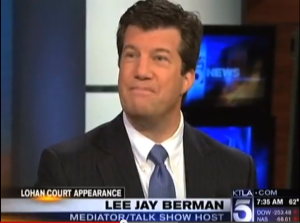 Lee Jay Berman is available for expert media commentary on news and entertainment programs on both television and radio. For more information, please contact his office directly at leejay@mediationtools.com or 310-478-5600. To schedule a mediation with Lee Jay Berman, please contact Natalie Diaz at natalie@mediationtools.com or the same phone number as above. His curriculum vitae is online at http://aiminst.com/cvljb. To discuss customized training programs, negotiation expert work, settlement counsel, or executive leadership coaching, please contact Lee Jay directly at leejay@leejayberman.com or 310-478-5600.